It's holiday season!! at least, it is for people like me who are working for US clients. Many of our clients will be on vacation from December last week to Jan first week and so we get time to plan long vacations. Iam thinking about how different we can spend this weekend, welcoming new year. Srisailam is located in Nallamalai hills in Kurnool district on the banks of river Krishna. Besides the Bhramaramba Mallikarjunaswamy Temple, clusters of minor shrines and Wildlife Sanctuary, there is the 512 m long Srisailam Dam on the River Krishna, which offers views of the Ghats, cliffs and forests. Nagarjuna sagar is around 150 kms from hyderabad. 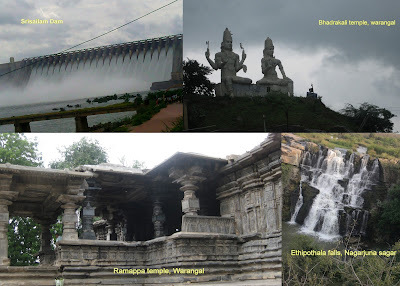 Nagarjuna sagar dam, Ethipothala waterfalls, Museum with Budhist excavations on Nagarjuna konda are some of the tourist attractions here. Ananthagiri hills near Vikarabad is nice peaceful place away from city buzz. Lord Anantha padmanabha temple, Vikarabad forest, trekking in Ananthagiri hills are main tourist attractions. Wargal saraswathi temple is located on a hill top in medak district on karimnagar highway. There is an idol about 10 feet high in front of the temple, which is a magnificent piece of art. The temple architecture is very good. Basara gnana saraswathi temple is located on banks of river Godavari about 205 kms. from hyderabad. This is famous place to do 'Akshara abhyasam' for children before commencing formal school education. Lord Shiva temple near Godavari bank is also a beautiful place. Just 60kms from Hyderabad is holy shrine of Lakshmi narasimha swamy temple in yadagirigutta. Surendrapuri and Bhongiri fort are also good places to visit. Bidar is a historic place in north-eastern part of Karnataka. It is a popular tourist destination for monuments and temples built in Bahmani era. Bidar fort and tombs of Bahmanis are popular tourist attractions. Black bug jungle resort is an excellent lakeside resort in the forest. Warngal has many excellent places to visit. Ramappa temple, Ramappa lake, Thousand pillars temple, pakala lake, Bhadrakali temple , Warangal fort and Eturu nagaram sancturay are only a few to name. Kurnool is a beautiful city on the banks of Thungabhadra river. Kondareddy buruju (kurnool fort), Belum caves, Ahobilam, sangameswaram, Alampur and Mahanandi are some of the important places to visit around Kurnool. Raghavendraswamy temple ,Lakshmi venkateswara temple in Mutt complex and Panchamukha temple in Raichur are some of the tourist places in Mantralayam. Navabrindavan, an island in between two branches of River Tungabhadra, between the districts of Koppal and Bellary, is at a distance of 175 km from Mantralayam. So, What's your plan for new year?? Thanks for giving the information about hyderabad resort.I’ve just liked it. It’s always a pleasant surprise whenever a post is both beneficial and enjoyable! Thank you, one more information about hyderabad resort.